Free application GClient integrates into the windows tray. Clicking on it will display a handy window showing your latest Google+ activities. This window allows you to post messages and to follow the activity of your circles. 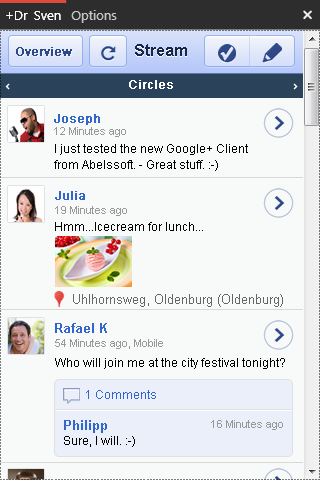 GClient allows you to perform all major tasks of Google+ without having to visit the website. Get Google+ notifications even when you don’t have your web browser open! G+ Notifier is a Windows utility that sits in the notification area and alerts you to notifications in the Google+ social network. Google+ requires a Google Profile — and right now, Google Apps users (people who use Google services at their private or work domain) don’t have access to a Google Profile. That will change in the future, but for now it can cause some annoyances for users who have Google Apps accounts. Google does allow users to switch between accounts, but this process isn’t foolproof. This technique would allow you to create an app for any website, but the focus of this post will be Google+. You could use Fluid.app for this, but the technique presented here allows for avoid Fluid.app.